Shop local with us this Holiday. Supporting our local small businesses is what Wildroots is all about, so what better way to do that than to add another Holiday Market to our schedule. Come out and buy one of a kind gifts for those you love this holiday season. It’s indoor, free, and full of great finds! See you there! The Wildroots Holiday Market will be staged in two storefronts along Main Street at Legacy Village – located on either side of Banyan Tree. 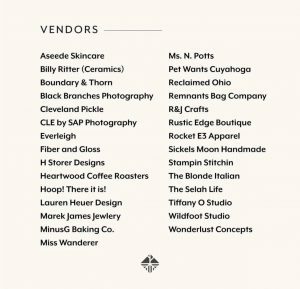 Between the almost 30 Wildroots vendors and the 35 local merchants represented at Merchant’s Mrkt, this is your perfect opportunity to shop local this season!